Most people have no idea what rekeying is, let alone a tumbler lock. In fact, they will often change the lock instead because they simply don’t know that a rekeying service exists. Now, rekeying a lock has a few benefits to it. In plain English, you get to keep the lock, but the key you used to use will no longer work on it anymore. That way, you get to keep your lock’s look while securing your home or apartment at the same time. Therefore, you can change the tumbler lock yourself using these three simple steps. Rekeying your locks from time to time, such as your front door, gives you great protection against burglars or robbers. It involves removing the lock cylinder from the knob or deadbolt and replacing the pins inside with a different set. The procedure for removing the cylinder varies according to the type of lock you’re working on, and it sometimes requires special tools. First, remove the doorknob or deadbolt from the door to access the lock cylinder. In most cases, you can do this by removing the decorations around the door with a screwdriver. Once it comes off, insert the control key and turn it 90 degrees to take out the lock cylinder. Once you’ve extracted the lock cylinder from the knob, if you’re working with a deadbolt lock, simply slide the cylinder out. If you’re working with a doorknob or lever, you need to perform a few simple operations with a cylinder removal tool. Turn the lock cylinder over and hook the small end of the cylinder removal tool on the C ring and pry it off. If you don’t have a cylinder removal tool, you can do this with a small screwdriver. Next, you’ll want to remove the plug from the cylinder. Place the follower against the back of the plug and push. The plug comes out the front while the follower remains in the cavity. Turn the plug upside down to remove the old tumblers. Use a key gauge to determine which plugs you should use to replace them. 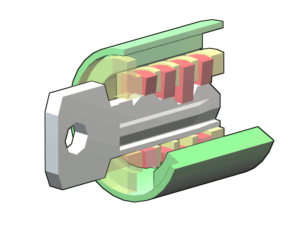 Divide the key into five or six sections, depending on the lock and measure the height of each section with the gauge. You then choose the correct plug for each section from a color-coded assortment. Once you’ve chosen the plug, drop the new tumblers into the holes in the plug, and then reinsert the plug into the cylinder. Remove the follower. Reset the C-clip on the back of the cylinder with needle-nose pliers. Finally, test the key before you reassemble the lock or doorknob. Hopefully, this post has provided some valuable information for you. We here at Quick Safe & Keys Service Los Angeles always want to make sure first that you and your belongings are safe. But if you still need help to rekey your lock, we are always just one call away, (323)275-9246. Rest assured that our technicians will be happy to perform a quick rekey service for you. Quick Safe and Keys Service Los Angeles is the premier destination for 24 hour locksmith services over the last decade. We specialize in car/home lockout assistance, lock re-keying, broken key extraction, and much much more. © 2010-2018 Quick Locksmith All Rights Reserved.